Chop Chop opened 5 days ago after a renovation. It has been busy the few times I have walked by since the opening. It's a small space with 6 counter seats facing the street which is great for people watching. There is a nice display of pastries by the register but the kitchen is visible in the rear and the dish washing sink on the side (docking half a star for appearance). Friendly cashier who recommended the lobster roll and said a customer has ordered it the last 4 days. The menu offers breakfast, sandwiches, salads, dinner and sides. I ordered the Lobster Roll and the Duck Torta for my boyfriend to go.Although the food did get a little cold from my walk home of one block, the food was delicious. The Lobster Roll had great flavor and nice chunks of lobsters but not quality or quantity for the $12 price IMO (another half star). Not sure what kind of bread it was, but it was nicely toasted with a slight amount of butter. Dish came with side salad and fries which had a nice crunch. The Duck Torta consisted of duck confit with a fried egg on I think a brioche bun. Egg was cooked perfectly with the yolk running all over with the first bite. The duck was very tasty and tender. It also came with the same side salad and fries. Friends also got the Sausage Roll and the Cajun Club which were also delicious according to them.We were very satisfied with the food and not overly stuffed. Everything tasted fresh, was delicious and well cooked. I would highly recommend this place and hope it stays open longer than the restaurant previously located here. It's a great addition to the neighborhood. I definitely want to go back and try the breakfast and dinner. Had the skirt steak with potato and parsnip mash and brussel sprouts. Good. and had the special banana walnut pancakes for breakfast. Love them. Open early - open late. Good food. whats not to like? It is a tiny space so get over seeing the sink and kitchen. Geez! I had a tasty sandwich (cujan club) excellent flavors the shop is on Nostrand Av & St Marks Ave. Not expensive , staff friendly And they deliver I will go back. tHE location is NOSTRAND between DEAN and BERGEN. I finally stopped in to try this place out last night. I got the sausage sandwich, and it was awesome; however, the menu listed the type of sausage as weisswurst. I was born in Bavaria and we had weisswurst for breakfast every day . . . it wasn't weisswurst. It tasted like an Italian sausage, and not a German one. And definitely not a weisswurst which has a very distinct flavor and color. While disappointed to not suddenly fall upon a childhood favorite in my 'hood, the sandwich was delicious regardless and I'll definitely be going back. Ask him what it was. I had the buttermilk fried sweetbreads with brussel slaw and sprouts. WOW! It was on special today. I liked it better than the lobster roll. So creamy delicate and delicious. worth every penny. Mr. Crownheightser and I tried Chop Chop Grub Shop on Friday for dinner, and it was fantastic. We got the duck torta sandwich and cajun catfish club to go. The sandwiches were delicious. The duck torta was filled with tender duck confit and fresh greens and the cajun catfish club was nicely cooked and balanced with pan-friend catfish, crispy bacon, and juicy tomato. Both sandwiches came with well-seasoned french fries and a mesclun salad. Guess how much it cost? A cool $20! Fantastic quality at a great value. If this is the future of Nostrand Ave, sign me up now. All they need is a cool awning or signage, and the proprietors of Chop Chop should develop into a really successful business. I went to Chop Chop a few weeks ago on a Saturday afternoon. I found all of the employees very friendly and I ordered a Catfish club just like crownheightster. I ordered mine to go and took it the few blocks home. Unfortunately when I got home, the sandwich's grease had gotten all over the sandwich and the bacon was overcooked (I believe). I ate what I could and enjoyed the fries, but will not be buying fried sandwiches like this to go from now on. I will still definitely try this place, especially looking forward to breakfast here sometime, but the first try did let me down a bit. The misses and I just ordered from here tonight based on the forum talk and Yelp reviews. The Cuban sandwich, spicy salmon and spinach salad with beets/fried green tomatoes was delicious!! So tasty. Although probably not intentional, this has earned them a lot of press. Besides the fact that I've heard their food is disgusting. Now I'll never find out if it's true. Deplorable. To say the least. No one paid any attention to the headlines about the debate and the court cases over Stop and Frisk? Way to alienate a portion of your potential customers! When businesses are controversial on purpose, they tend to gain other customers: The Chick-Fil-A stance re: gay marriage comes to mind. In that instance, it seems as if they knew they would lose customers who support gay marriage, but gain those who did not. It is hard for me to believe that such a calculation was made re: the local customer base re: Stop and Frisk. ....Quinn's support of Bloomberg's use of Stop and Frisk likely caused her to lose the election. It isn't something a restaurant should haphazardly joke about. Only Storage companies can get away with joking about politics on their ads! Brokelyn, Gothamist, and Brooklynian are for entertainment only. News no longer exists. well whoever told you the food is disgusting doesnt know what they are talking about. There are plenty of restaurants on Nostrand Avenue you can say that about, but this isn't one of them. and just because you heard it doesn't make it a fact. But your statement says more about you than the nice people at Chop Chop. I've had their food and enjoyed it. And I thought the people working there when I went were lovely. I also love word play more than the next girl. I even have a Facebook photo album dedicated to fun food signs -- like Bottlerocket wine shop's "Game of Rhones" sign and Sur La Table's "Peas on Earth" holiday gift cards. But this sign is offensive. At the very least, it's totally tone deaf for a new business to put this up in a neighborhood that's made news for its history of stop and frisk (http://www.dnainfo.com/new-york/20130205/crown-heights/one-brooklyn-neighborhood-two-very-different-faces-of-stop-and-frisk). The thing about something being offensive is that it isn't always consciously done. And, even when consciously done, it can have a different effect than desired. Of course, everyone gets to opine on whether we think they knew (or should have known) the impact of their actions. I would guess (in the total absence of actual facts) that the shopkeepers at Chop Shop may have overestimated the degree of gentrification of their neighborhood... i.e. they might be so focused on their preferred gentrified demographic that they are blissfully unaware of the feelings of those neighbors who do not fit within that demographic. In which case they may be shamefully insensitive, without being at all evil. Do you think # 6 will make an appearance on Brokelyn, Gothamist, or on Brooklynian in response to this sign? I've think I've seen # 6 around these parts, and am pretty sure that s/he has good intentions. When I passed by the sign, I thought " not the greatest line", But I know these people and know that no offense was meant. At least it has given us an opportunity to share views and gain insight and perspective on our lovely neighborhood. Gotta go out and check the shooting on the corner of st. marks and bedford. If Chop Chop Grub Shop wants to try to attract a certain demographic, that's within their rights, but this sign was a tone-deaf way of doing so (at the very least). Not good. I do think the discussion around it, here at least (the comments on other sites are pretty crazy), was a positive opportunity to learn about some of the different perspectives/experiences in the neighborhood. And I agree that no offense was meant, but also feel they should have known better. FYI, they shared their side in this DNA Info story: http://www.dnainfo.com/new-york/20140807/crown-heights/sign-urges-diners-stop-frisk-your-appetite-at-crown-heights-eatery. "Last week, in an effort to showcase our specials, we used a messaging topic around the controversial policy of 'Stop and Frisk'. While the signage has since been replaced, we would like to acknowledge the feelings and concerns of our patrons and neighbors and apologize to those whom we have offended. It was never our intention to promote or condone any policy or make light of any social issue. From our delivery drivers to business owners, we are a diverse team that works hard to provide a great customer experience while offering fresh and seasonal selections to a diverse community and when we fall short, we'll always do our best to make it right." Wow. How culturally insensitive can you be? I'd be willing to be a tooth that Malcolm & Otis have never been profiled, stopped and frisked. Dudes were probably trying to be funny but they just lost a customer. Oh come on! Have you never said anything stupid your entire life? They did and they apologized, and their entire multicultural staff wants to get back to business providing flavorful food to the community. Have a little christian charity and find it in your heart to forgive. At worst it was just a bad attempt at humor, and more likely much ado about nothing. Sadly there are people who read a blog and want to rush to ruin a business, as you can see from some new yelp reviews and the person above saying they have horrible food. I'd hope that those who support their business, go put positive reviews on yelp to counter the a.holes. These folks opened a nice spot in the community, serve it, and hire from within it. Does anyone know if their business is suffering? Seems like people on yelp are out for blood. The Yelp contributors may not be actual customers, but merely people who feel this an offense that warrants revenge. The actual present and past customers of this place may continue to patronize it, despite this controversy. At this point, I think Grub Shop has done everything it can do to repair the damage, and now must merely hope it has done enough. ...I suspect everyone has made up their mind, and isn't going to change it. Yelp is very good at removing non-reviews. So don't expect the dip on their ratings to last too long. Will Chop Shop make it? Who knows? You're right. You're right. I've said and done many stupid things. Maybe we can go by together to grab a snack this week....but can I at least walk in looking like this? Not if the place is run by Smurfs. you can walk in anyway you like. lets make it next week. I am trying to accomplish the impossible until sunday. chop chop is slated to close. Today is their last day. last chance to enjoy their wonderful food. Had French toast and and got a pork rib sandwich to go. I am very unhappy about this. They opened in January 2014, so they existed for almost exactly a year. I always wanted to try them but I thought they were kinda way overpriced for a takeout and delivery place. Oh no. 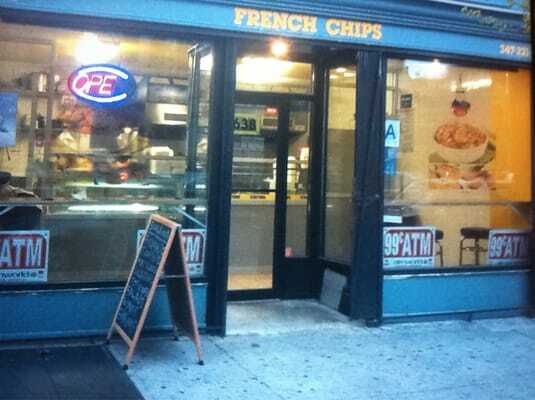 They were one of my favorite restaurants on Nostrand. What happened? I assume they weren't real profitable and had an exit clause on their lease, at the one year mark. waitress said that the holidays were really slow and they didn't have enough money to stay open. bummer! I loved eating there but admit i could afford to do so only once every other week. You know, they were really hampered by the landmarking rules on the primary building facing Dean cos they could never get a proper contemporary signage on the building. I really miss this place. The space has remained empty since they closed. Anyone hear any rumors about what will become of it? I just did a quick search of the address (638 Nostrand) and did not find any active ads looking for a tenant. ...so, unless the landlord is pitching it to a less public audience, it may be vacant for a while. d of 3 little places to rent? Goodbye Chop Chop! Hello Oh Taco! Hope I got that name right. guys working inside the place for a month said they are ready to open in a few days. Also Japanese coffee cafe is set to open on Bergen by the bus stop soon. Where is that list of all the Nostrand Ave happenings.? I think that list is too dated to resurrect. Perhaps we should just start a new thread? I call it the AirBnB effect. I also would like to hear more about this Japanese coffee cafe. Something's happening in the old Elsie's donut spot, too! Lots of activity near Nostrand.